The process is extremely simple when using the Continuation File function. To begin, you would need an existing drill file. Open the drill that you would like to continue FROM (the drill which contains the last set that you would like to copy). Go to File, and choose New Drill. 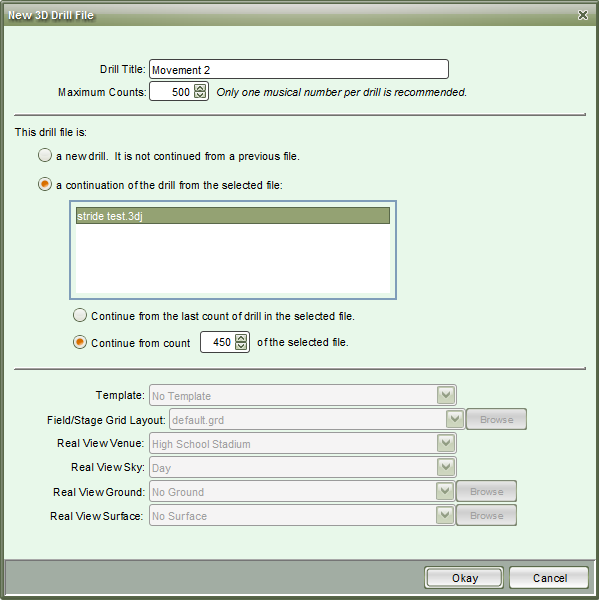 In the New Drill window will be a section for continuing the existing file. Select the file in the list, and then choose whether to continue from the last count of the selected file, or count X (where X is the count you specify). Set any remaining options for the new drill. The new file will be created, with the form from the previous drill set as the opening picture of the new file. *Once the file is created, be sure to import your Cast List information so you don’t have to relabel all performers!